- fyi the buffalo whr-g125 is onsale this week at Circuit City for $25 after MIR. - I picked one up today and flashed the latest ddwrt. It was really easy using tftp. It worked the first time. The whole process takes just a few minutes. DO SO AT YOUR OWN RISK! Supposedly after the initial flash, you can do future upgrade flashes using the web interface. - Wow talk about a lot of options to play with. Performance has been at least equal to my old netgear wgr614. - Ok after the nvram restore I ran into another bug. The wireless wasn't working and the option to broadcast ssid vansihed. After going through the wireless setup tabs and applying each one things were back to normal. I used IE this time too instead of firefox but I don't think that made a difference. Yeah this firmware is still beta but I'm sure they'll work out the kinks. - Works great with the 360 with uPnP enabled showing full open NAT on the xbox live test. Well worth the $25 (about the cheapest bridge out there if you plan to use it that way). So v24 is finally out! - I rebooted the router, loaded up v24 std generic using the web interface, and then another reboot. - Everything seemed to work fine. 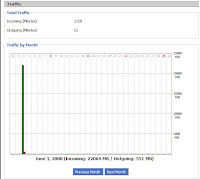 The new Bandwidth monitor and traffic graphs are great. - I decided to give QoS another try. I have to say this final version of v24 seem quite bug free. So here is how I tested. I pinged the maxpc/pcgamer tf2 server. Without QoS ping jumped an avg 206ms!!!! With Qos ON ping only increased by 4ms!!!! - You can feel it too while just surfing. Everything is just so much more responsive. Youtube and hulu videos streamed perfectly. I can see my DL speeds drop down to around 3mbps while streaming video which means QoS is doing its job! - I used 80% values (for my DSL connection I get around 5.4/540 max so I used values 4.3/400). So the only drawback is my download speed maxes out around 4.3mbps which I can live with. I think the trade off is well worth it. I ran some more numbers trying different down/up limits to see impact on ping. My real world down/up is around 5400/540. So it seems the most efficient range would be between 4600 - 5000. Anything higher and ping starts to go way up. Now it's just a trade off on how much bandwidth you wish to utilize vs what is an acceptable ping. I'm trying out 4800 for now. I've tested hulu.com hd 720p content and you do have to buffer a bit longer or else it can't keep up with the streaming and the video starts to stutter. I also tried TCP Vegas (without QoS) and it didn't seem to help pings at all. So I'm leaving tcp vegas off and QoS on. . This is more due to the fact the video stream bitrate is higher than 5mbps and with QoS I'm limiting it to 4.8mbps. v24 sp1 has been released. 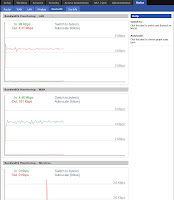 I power cycled the router, installed v24 sp1 through the web interface, and let it reboot. It seems to work fine. I did something really stupid and fried my poor buffalo router. I've since replaced it with a Linksys WRT301N with dd-wrt on it.